The Rolls-Royce Cullinan SUV is now available for sale in India at Rs 6.95 crore (ex-showroom India). The first such car from the British luxury marque launched internationally in May 2018. 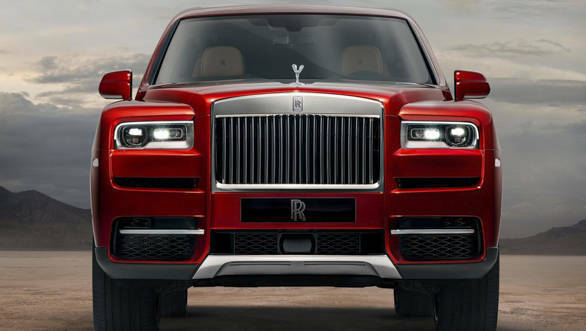 The 6.75-litre twin-turbo V12 petrol that debuted with the Phantom 8, motivates the Rolls Royce Cullinan too. Under the hood of the Cullinan, it puts out 571PS of power at 5,000rpm and 850Nm of torque at a mere 1,600rpm. 0-100kmph is estimated around the 5s mark (no official word), while the top speed is restricted to 250kmph. The heft of the Cullinan reflects in its efficiency, with the claimed carbon footprint being a large 341g/km and a claimed overall fuel economy of 6.6kmpl. The Rolls Royce Cullinan is built around the new 'Architecture of luxury' all-aluminium spaceframe that debuted with the new Rolls Royce Phantom VIII. 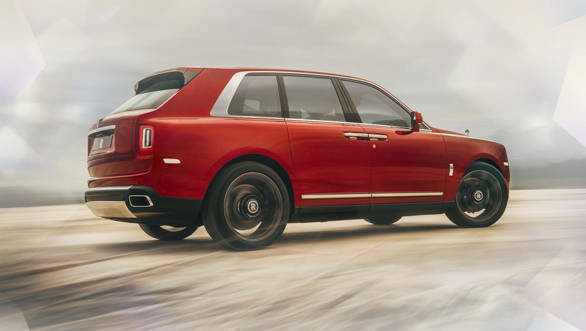 The Cullinan weighs about 2,660kg which makes it 200kg heavier than the Bentayga but relatively light for its size. It is suspended by an all-independent suspension made up of air-struts in all four corners, mated to double wishbones up front and a multi-link setup at the rear. The suspension is set up for a magic-carpet-like ride than long travel. It even gets an 'Everywhere' mode which alters chassis and drivetrain components to take on the trickier conditions. The Cullinan has a water wading capability of 540mm and for the first time on a Rolls Royce, a 4x4 drivetrain. 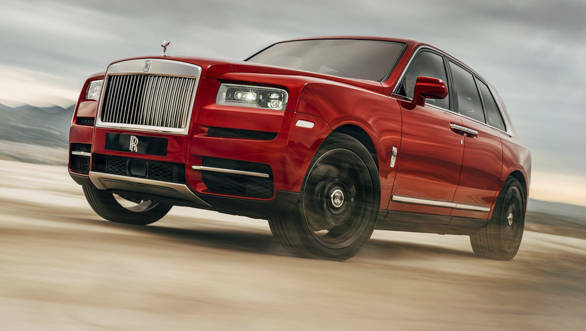 There is no low-range gearbox because Rolls Royce believes that the Cullinan won't need one given the strong low-end torque and a finely tuned torque converter from ZF. The Cullinan has a powerful design expressed through a classic three-box form. The tail protrudes out, while the long nose gives it a cab-rearward design typical to a Rolls Royce. The Cullinan is a large car, it is 200mm taller than the Phantom and rides on 22-inch wheels. At 5.3m in length, it is 200mm longer than the Bentayga and 350mm longer than the long wheelbase Range Rover.The headlights and air dams are set further into the face compared to the saloons, while the polished grille isn't overly large, contrary to what the purists feared. The 3,295mm wheelbase ensures the cabin is typical of a limousine. The Cullinan welcomes you to a flat floor and uber-luxurious individual seats by lowering itself by 40mm and raising back up when the driver thumbs the starter. There is the typical Rolls Royce minimalism in the cabin's symmetrical design. The dashboard is done up in open-pore wood and new box-grain leather. Driver aids comprise 360 degree cameras, a 7x3 heads-up display, cross-traffic warning, lane departure and lane change warning, night vision and attention assist. There is wifi hotspot capability, amongst a host of other creature comforts meant to pamper the owners. The Rolls-Royce Cullinan SUV offers a suite of bespoke features developed specifically for this car including the viewing suite rear jump seats and the 'Recreation Module'.